Today I’m digging into my photo archives for a brilliant splash of color. Other than the Northern Cardinal, winter is not a very colorful time for birds in the Chicago area. By November the summer residents have all gone south, their cheerful songs and bright feathers just a memory. So today I’m featuring the Indigo Bunting, a gorgeous songbird that summers in the eastern two-thirds of the US and southeastern Canada. In the winter they migrate to southern Florida and the tropics. This photo was taken in early August. The male turns a vibrant blue in the summer and fades to pale brown in the winter. By the time they arrive here in the spring they already have their vivid breeding plumage. This male was cheerfully singing his bouncy song from the rose garden. As as a group of us walked past he just kept singing. The males will sing from dawn to dusk and can be seen in tree tops, shrubs and even along the road side on telephone lines. We surmised he had a nest nearby and the singing was to distract us. The Indigo Bunting is a songbird that displays sexual dimorphism in its coloration. While the male turns brilliant blue, the female stays brown year-round and is often difficult to find. She doesn’t sing but instead is busy doing all of the nest-building and incubation of the eggs. 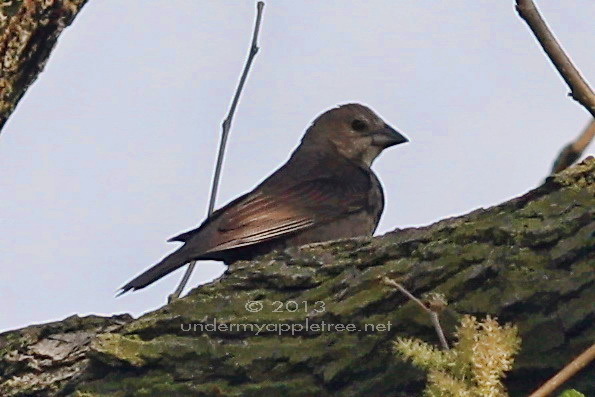 And when a female is seen, she can be mistaken for a large sparrow or small cowbird. How do I know this is a female indigo? 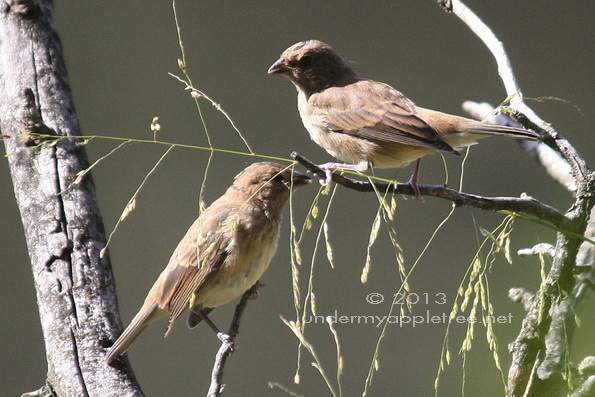 Both male and female youngsters look like mom until they grow their adult plumage. I saw these little guys while monitoring birds for the forest preserve in September. Unfortunately the sun was behind them washing out their color and creating shadows, but this makes a good enough photo for identification. By the end of October the Indigo Buntings had departed on their journey south to their winter homes and won’t return to the Chicago area until April. Beautiful shot, pink and blue. It’s nice to see some color as we enter the drab season of gray, brown, and white. Winter is always way too long for me, and this year it’s starting early. I’m already counting the days until I can shoot some bird photos with flowering tree buds in the background. Sigh. I love bird photos! Thanks for sharing!! Terrific shots, Leslie. 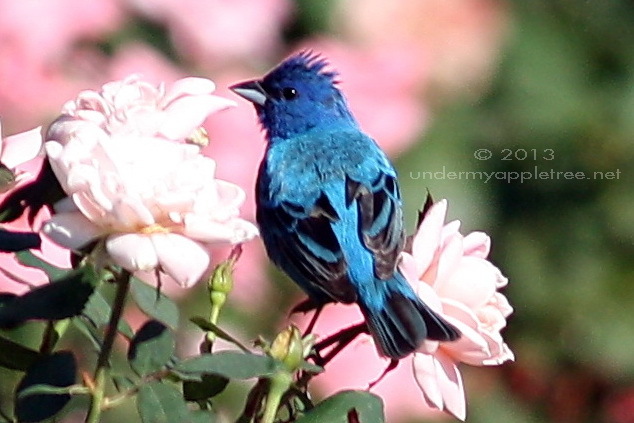 Indigo Buntings are one of my favorite birds! I was thrilled the first time I saw an indigo bunting while up north on a vacation in the summer. 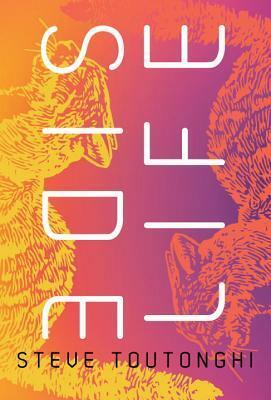 So brilliantly colored. In Missouri, the state bird is the blue bird and it’s also a sign of spring. Better than the robin, these days. We have robins all year round, now, although I understand that our winter robins are the ones who spend their summers up in your area. I’ve heard the same thing about the robins, that the ones that come to Chicago in winter probably nested further north. Doesn’t make much sense to me for them to migrate but I’m not a bird! What I do notice is they leave the backyards, form large flocks and roam around to find food. Makes sense they would roam south. I know I would! What great photos. I particularly love that first one of course. He’s so magnificent, and looks wonderful sitting on the pink blooms. I was with a group from my bird club the day we saw the indigo. He made several people with cameras very happy by posing so nicely for about 5 minutes. That seems to happen too often in the bird world! Beautiful photos. This is the time for birds to migrate, but it is nice to have a look back! Great shots, as usual, Leslie; love the muted pastels in the background of the first one…and then the contrasting sharpness in the next-to-the-last shot. Spectacular photos! I especially like the first one! I don’t think I’ve ever seen one up here but according to your source they’re around. I’ll have to look – although I think I’d only recognize the male. What a gorgeous shade of blue. I’m sure you have them in the forest preserves. I always hear them before I see them. Once you know the song they’re easy to find. Of course I didn’t learn the song until I went on field trips with my bird club. Beautiful! I love Indigo Buntings, but we don’t see them around here much. I’m pretty sure we have once, though. I thought blue wasn’t really a natural color. But it is! What a wonderful little bird. Thanks for sharing your interesting bird stories. I love them. No, you’re right, blue is not a natural color. They look blue but lack blue pigment. We see blue when the light is reflected off microscopic structures in their feathers same as the sky only looks blue due to refraction off particles in the air. I probably should have mentioned that but I didn’t want to get too science-y! Ah, interesting. Thanks for explaining! this is such a beautiful shot, showed it to my son who is a budding ornithologist at 10 years..:) he was happy he learned of a new bird..
Why are you teasing me with this beautiful blue bird when I’m looking at a snowstorm outside? It seems mean 😉 I love how much I learn about birds from you!